This unusual wand features a beautiful Goddess carved at its tip. 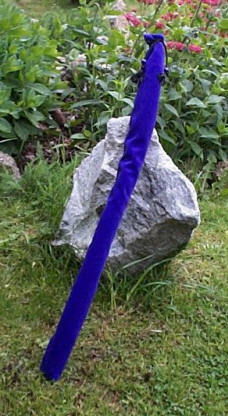 Please note: Higher postal charges apply to this wand for non-UK delivery unless this wand is shortened to below 50cm. Please see details of postage charges above. UK delivery is unaffected. This beautiful, curvy wand has been crafted from Blackthorn wood which is naturally twisted, a rare occurrence. This unique wand is carved with a beautiful twist, oak leaves and also an acorn at the base. The handle has the natural oak bark left in tact. This beautiful wand would make the perfect gift. Please note: Higher postal charges apply to this wand for non-UK delivery. Please see details of postage charges above. UK delivery is unaffected. The wands shown below are all sold. If you'd like to be kept updated about new wands as they're crafted please "Like" the Spirit of Old Facebook page, thanks. This petite and very slender wand is beautifully tactile and feels so lovely to hold. The wood is bog yew from Ireland and is around 5,000 years old. It is a beautifully warm colour, grained with rich reddish and deeper brown tones and feels full of positive energies. This beautiful wand is crafted from blackthorn wood which features a natural twist, formed by entwining with a branch as it grew. The bark on the handle is left intact, creating a wonderful contrast to the warm tones of the inner wood. The wand is filled with hedge-gathered herbs which are traditionally considered to be sacred to the Druids: lavender, vervain, yarrow, marjoram and mugwort. The herbs are permanently sealed inside with a protective plug of mistletoe. The wand is finished with a quartz crystal tip. This beautiful, slender wand is crafted from hawthorn wood which is naturally twisted. The core is filled with hand-gathered, organically grown herbs which are traditionally considered to be sacred to the Druids: lavender, vervain, yarrow, marjoram and mugwort. The herbs are permanently sealed inside with a protective plug of Celtic bog oak from Suffolk. This beautifully petite wand is crafted from naturally twisted hawthorn and it retains its sense of magick and the woodland. The wand has warm colours and a natural twist, formed by gradually entwining with wild honeysuckle vine as it grew. The core is filled with a dried herb, the beautifully named enchanter's nightshade, which is permanently sealed inside with a protective plug of mistletoe. A truly unique piece and full of wonderful energies. This wand is crafted from blackthorn wood which has the beautifully rich-coloured bark left intact. The handle is carved into a detailed skull and the wand is finished with a quartz crystal at the tip. Blackthorn is considered to be a keeper of secrets. Its vicious black thorns make it impenetrable and it is a tree of great density and strength. This lightweight and simple wand is crafted from blackthorn wood which features a natural twist, formed by entwining with a branch as it grew. It is finished with a quartz crystal tip. This beautiful lightweight wand is crafted from hazel wood which was respectfully gathered from near to the ancient, sacred site of Stonehenge in southern Britain. The handle is carved with an owl. Owls are traditionally connected with wisdom and protection. They were associated with witches and magick and also said to have great powers. The Hazel has strong associations in mythology with knowledge and the gaining of wisdom. It was sacred to the Celts and is associated with springs and wells. This beautiful lightweight wand is crafted from hazel wood which has a natural twist from growing entwined with wild vine. The warm coloured bark is left intact on the handle to contrast with the paler inner wood. The wand handle is hollowed and filled with hand-gathered, organically grown herbs which are traditionally considered to be sacred to the Druids: lavender, vervain, yarrow, marjoram and mugwort. The herbs are permanently sealed inside with a protective plug of ancient Fenland bog oak. Lavender is a powerful herb which brings peace, harmony and encourages positive thought. Vervain is a sacred cleansing and purification herb which is also believed to raise vibrations within the space. Yarrow brings its strong associations with clairvoyance and powers to promote divination. Marjoram is also added for its traditional connections with love and the heart. Mugwort has been used for millennia to aid clairvoyance and astral projection. Our ancestors drank tea made from the leaves and it has also been used in incenses or smoked to induce visions. This petite wand is crafted from hazel wood which was respectfully gathered from next to the ancient, sacred site of Stonehenge in southern Britain. The tip is finished with a quartz crystal. The wand handle is hollowed and filled with hand-gathered, organically grown herbs which are traditionally considered to be sacred to the Druids: lavender, vervain, yarrow, marjoram and mugwort. The herbs are permanently sealed inside with a protective plug of blackthorn wood. This lightweight and simple wand is crafted from hazel wood which features a natural twist formed by entwining with wild honeysuckle vine as it grew. The Hazel has strong associations in mythology with knowledge and the gaining of wisdom. It was sacred to the Celts and is associated with springs and wells. 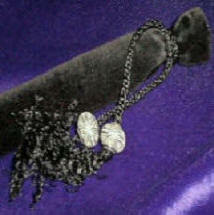 It can help you to open yourself creatively as well as leading you to inspiration and inner guidance. This wand is crafted from blackthorn wood which has the beautifully rich-coloured bark left intact but sanded smooth and polished to a deep shine. The base has a wonderfully tactile rounded knob with natural graining. 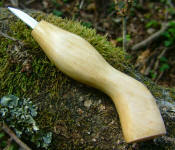 This wand is carved from a beautifully warm-coloured yew root. It is wonderfully smooth and tactile to touch and it features a natural panel of darker wood which is inscribed with the old Norse runic script "I draw upon the forces of the nine worlds". The handle has nine plugs of mistletoe added, traditionally a sacred herb to the Druids. This beautiful wand is crafted from a yew root which was respectfully gathered from the area around the ancient, sacred site of Stonehenge in southern Britain. Yew has associations with the element of earth, particularly strong with this piece as it's formed from a root. The wand has warm colours and wonderful graining and has a carved scroll winding around it with Irish Gaelic translated into ogham meaning "I weave my magick". This beautifully grained wand has been crafted from a gnarled root gathered from a fallen ancient Yew tree. It is carved with a detailed Wise Owl. This petite, lightweight wand is crafted from birch wood which has a natural twist from growing entwined with wild vine. The wand handle is hollowed and filled with hand-gathered, organically grown herbs which are traditionally considered to be sacred to the Druids: lavender, vervain, yarrow, marjoram and mugwort. The herbs are permanently sealed inside with a protective plug of ancient Irish bog oak. The tip is finished with a quartz crystal. 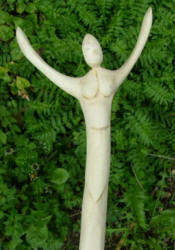 Birch is associated with purification, protection, fertility and healing. It is also strongly connected with new beginnings, cleansing and new creativity. What better way to store your wand when not in use? Traditionally, wands are stored in darkness - wrapped in black cloth to protect them against negative energies and our wand bags will do just that. Each bag is made to measure in soft velvet and has a black lining and black twisted cord closure adorned with beads (beads may vary from those pictured).